1. I am generally sympathetic to the idea of trading greater micro-economic freedom for a somewhat more generous income support system. I would prefer that that greater generosity come from the private sector, but even without that modification, such a trade would probably leave us better off than the status quo. 2. The studies used to support the proposed changes are remarkably weak. I don’t doubt there are improvements to be made but I would hope for better empirical data. 3. Consider whether such changes are more likely if many of these programs were block granted to the states, perhaps with some increase in funding. Then you get to use states a laboratories and potentially try many different reforms, while competition for workers encourages states to design better programs. 5. Is there any reason this needs to be linked to the state? Consider making state payments supplemental to those provided by private organizations. For example, the government could set a support level of $10K/year, that would reduce by a dollar for each dollar of private support made available, and give citizens tax credits for money given to such private support. I know this suggestion is too crude to workable, but it would be nice to avoid the state crowding out the supports of civil society further than it already has. 6. Given the magnitude of medical costs, you probably need to address those specifically in ways that don’t involve spending more money. This is bound to be politically problematic, but you might be able to do something as part of a larger trade. 1. The mass media discourse is only a small part of the actual discourse in America. If you looked closely at the proliferation of online discussion platforms, I suspect you would see the vast majority of discussion is on non-political topics. Politics has some universal interest, however, so it is disproportionately covered by media with a universal reach. 2. We know more about what is going on in government and that leads to news coverage of the political. The easy access to information makes stories about the political easy to write so they get written. The easy access exists both because (I) politicians are elected creatures and want to reach a mass audience, and (ii) open government laws make it easier to get information about government activities than those of private entities. 3. I question whether this phenomenon is stable. Just as no TV show gets a 30 share anymore, I hypothesize that coverage of politics will become more niche just like everything else. I am not sure whether that change would be good or bad. As I listened to this podcast I was struck by the link between the selfless behavior described and behavioral economics. They both seem mainly to describe behavior in small groups. For example, the behaviorists describe many ways in which individuals are irrational in decision making (e.g. being more averse to losses that they would value like gains). Yet stock markets operate efficiently at least in the sense that no one can use these insights to consistently profit. The behavior is observed in individuals, but in not when they act with many others in a crowded market. Why? The structure of the market (*e.g. opportunities for arbitrage) bleeds the irrationality out of market prices. Likewise, the selfless traits of individuals (and perhaps their innate sense of justice) also seem to get lost when they deal with others in large anonymous market– witness past political demands for mandatory minimum sentences, multi-level marketing schemes, people taking advantage of government programs who are not truly needy. The simple conclusion is that crowded markets (and perhaps other spheres) produce more rational results– but that is not always a good thing. I suspect there are deeper insights to be had about institutional design to incorporate this insight, but for now I leave that to others. Why is there not Microsoft TV to compete with $99 boxes from Apple, Roku, Amazon and Google? Ii seems to me Microsoft should sell a $99 box that runs a variant of Windows 8.1. If Apple, Roku and Amazon can make such a box, why can’t Microsoft. This device could run media apps for Windows RT and the Xbox One. I am probably being overly simplistic, but it seems like For the first time in years Microsoft’s platforms are well aligned to make this happen. Xbox One is running a variant of Windows, so making its apps run on this device should not be too difficult. The Windows RT apps run in a much more constrained environment that is well suited for a device rather than a PC. Now that WIndows is running on ARM, if necessary they could use an ARM processor. Windows now runs leaner than ever, reducing the hardware resources (and cost) needed for such a box. The acquisition of Nokia gives Microsoft access to personnel skilled in hardware manufacturing and sales. This may not be a billion dollar business, but it preserves Microsoft’s ability to keep its platforms and services wherever people might want them and that should be important to them, especially if their services are not welcome on boxes running of other platforms, e.g. Android TV, Fire TV or Apple TV. The original unveiling of the Xbox One touted its prowess as a media consumption device. Its HDMI input would allow it to be used to watch TV and other apps would bring the user other media. The new Kinect would allow everything to be controlled futuristically by voice. With the release of the Smartglass beta, some of that promise may finally be realized, but it was not always so. When the Xbox One came out, the Xbox wasn’t so great at processing certain 5.1 signals from the HDMI in, voice proved to be awkward as a primary input mechanism and the Xbox interface combined with a controller or remote was not a great experience either. Further, those people with DVRs could only watch live TV. They could not access or set shows to record. It provides a slick, easily navigable second screen interface to access content on all the Xbox One media apps. It duplicates the functionality of a DVR remote so that you can access all the other features of your DVR besides live TV. It provides an serviceable way to move around the Xbox onscreen interface. It provides additional information on various possible media selections, e.g. a program synopsis. Controls for volume, play and pause (and other transport controls) are available from anywhere—no matter what content source you are watching, be it Netflix or live TV. Finally one guide and Bing searches are really useful enabling relatively easy access to content across services. It turns out a second screen better than voice control. Further, the sound pass-through issues with the HDMI in appear to have been resolved and the Kinect acts as a really effective IR blaster to control your DVR, TV and Receiver. Although it is not perfect and there is much room for improvement, this my be the best integration of a remote control with robust second screen content selection out there. The Harmony app has no second screen content selection and all other second screen apps are unique to individual media sources and lack any universal remote capability. When switching to watch TV, the Xbox One does nothing to get to live TV on your DVR— the only place channel selections can operate. Smartglass should send command to make sure the DVR is displaying live TV whenever starting the TV app and whenever changing channels after using the remote control functions. (For TiVo sending the following three commands would do just that: Menu, Guide, Guide (which will get you to Live TV no matter where you are). It takes too long for TV listings to load on smartglass. Support of OneGuide in Xbox apps is inconsistent. For example there is no Netflix in OneGuide and Vudu doesn’t show selections from your library. In experienced some freezes and dropouts when watching a TiVo Roamio on one of my Xbox Ones, but not when using a TiVo Mini with another. It is hard to know whether these issues are significant, but how would I get them fixed if they persist? There is no good way to play content on a local network server. Some content can be played from OneDrive, but that is less than ideal. A nice Plex or DLNA client would be welcome. The Blu-Ray played in the Xbox One still has no 3D capability. The means I have to keep a standalone Blu-Ray player. I hope that the Xbox One team addresses these issues and continues to work on these features. There is a great deal of promise in the Xbox One for home media aficionados. 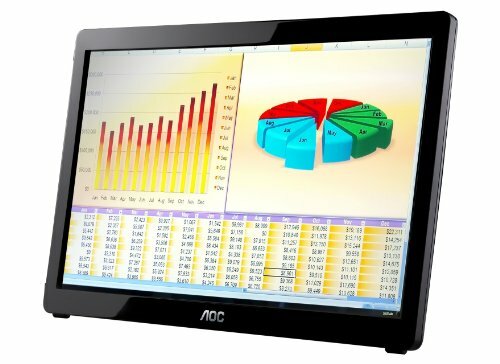 I recently purchased the AOC E1649FWU, a 16″ USB powered portable second monitor for less than $90. I bought it with the idea of taking it on vacation so that when I have work to do with the laptop I bring along, I will have the use of a second monitor. I have every intention of using it that way, but right now it has found a home as a second monitor for our family room PC. It works surprisingly well as a second monitor that can be brought out for occasions when doing substantive work on that PC and put away (so as not to clutter the desk at other times). The monitor fits into an old 17″ laptop bag along with our new ultrabook and is powered by USB, so no need for a heavy power supply. After the Sony PlayStation 4 E3 press conference announcing that PS4 games could be resold while the Xbox One places restrictions on transfers of games, the Sony policy is being hailed as more “pro-consumer” than that of Microsoft. I suspect there is less difference than meets the eye and what difference there is exists because of technical differences in how the two consoles handle the DRM (digital rights management) for game software. Contrary to exaggerated claims, it is not as if the PS4 games have no DRM—after all it will obviously not be possible to make copies of your new PS4 games for your friends. The difference is that Sony is handling DRM at the level of the disk itself, whereas Microsoft is handling DRM by associating a given game with a users online Xbox Live account (the same as their Microsoft Account). On either console when a game is transferred to a new user, there must be a mechanism of preventing the transferor from continuing to use that game. In the case of the Xbox One, a game seemingly can’t be played for more than 24 hours after the console has “checked in” online to confirm the the player is still the authorized owner of the game. In the case of the PS4, the disc itself must be in the drive to play the game. Publishers can set policies for the transfer of games (“publishers can enable you to trade in your games at participating retailers”). Microsoft would be wise to require that any cross-platform titles have restrictions that are no more limited for Xbox One games than for PS4 games, however so it is not clear how big an issue this will be. Transfers to “friends” seem to be artificially limited (“you can only give them to people who have been on your friends list for at least 30 days and each game can only be given once.” This seems designed to appease retail sellers of used games (e.g. GameStop)) and to limit the velocity of game turnover— because ownership of Xbox One games can be transferred electronically, more people could play a game and then resell it faster than would be possible with the physical transfer of the disc being required to transfer a game. That being said these restrictions do not seem well tailored to address that issue. Game rentals won’t exist at launch (“Loaning or renting games won’t be available at launch, but we are exploring the possibilities with our partners.” There is no obviously easy way to allow rentals of use rights. Even if there was, there would need to be limits because of the increased velocity of transfers/rentals that would be possible. The bottom line is that we don’t yet know whether these restrictions will make a big difference between the Xbox One and the PS4. No need to swap discs to play different games—something I personally dislike and which limits my enjoyment of older titles. In a house with multiple Xbox Ones multiple family members can play the same game simultaneously, e.g. we could play a private game of Halo on our four consoles using just one purchased game. Game distribution need no longer involve expensive retailers. You can have have access to your entire game library from any console. You can enable third party add-on storage (e.g. 3TB hard drive) without worrying about DRM. Of course Microsoft could have set up a a dual system where certain rights were accorded to digital purchases and copies played from physical discs lacked those rights, but I suspect that would have angered retailers.